Can Pregnant Women Eat Eggs Sunny Side Up? Bacteria intestinal infections can cause serious complications in pregnancy. Raw eggs can spread salmonella bacteria as well as listeria or Toxoplasma gondii, the bacteria that causes toxoplasmosis. Sunny-side up eggs often have a loose, uncooked yolk that may taste good with toast, but they pose a health risk to you and your baby. 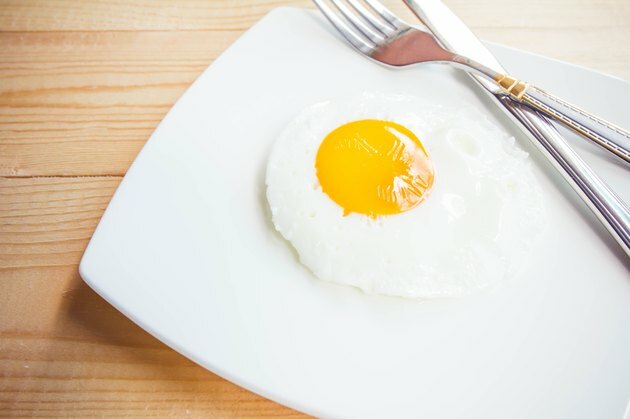 Don't eat sunny-side up eggs unless you cook both the yolk and white of the egg to a solid consistency. Thorough cooking destroys most bacteria. Raw food can contain a number of pathogens that make you sick if you eat them. Cooking food thoroughly usually kills the bacteria. Around one in 20,000 eggs contains salmonella, according to the American Egg Board. While you may associate listeria, another food-borne infection, with lunch meat, raw eggs can also contain listeria. Listeria affects pregnant women 14 times more often than non-pregnant women, according to Colorado State University Extension. Raw eggs can also contain toxoplasma gondii. A French study reported in the March 2010 issue of the "International Journal of Food Microbiology" found listeria in 25 out of 144 raw egg samples collected at three different plants on three separate occasions. The bacteria that causes toxoplasmosis also can develop in raw eggs. It may take between three to 70 days for the symptoms of listeria infection to appear; in pregnant women, listeria often causes mild symptoms, including fever, headache, muscle aches and fatigue -- although vomiting and diarrhea can also occur. Symptoms appear around three weeks after infection, on average. You may run a high fever before or during labor. Listeria can cause premature delivery, miscarriage or stillbirth. Your baby could also have a serious infection after birth. Twenty-two percent of cases of neonatal listeriosis result in stillbirth or infant death shortly after birth, according to the American Pregnancy Association. Raw eggs can contain several types of salmonella bacteria, but cooking eggs to 165 degrees Fahrenheit will kill the bacteria. Salmonella causes fever, vomiting and diarrhea in pregnant women, but most strains don't affect your baby, unless you go into preterm labor from dehydration. One type of salmonella, Salmonella typhi, which is rare in the United States, can cause preterm labor, miscarriage or stillbirth. While 1.5 million people develop toxoplasmosis each year, according to Colorado State University Extension, many have no symptoms. If you develop the infection during pregnancy, you may have a mild fever, muscle aches, headache and swollen lymph nodes. Fetal effects include stillbirth or prenatal death, in addition to birth defects, including eye defects or brain damage, that may take years to appear. BabyCenter; Is it Safe to Drink Eggnog During Pregnancy? Amanda Leonard, R.D.